in the Legislative Assembly of Assiniboia by Hon. John Lazarus Norquay ‘Sr.’ (not to be confused with John Norquay ‘Jr’ who became premier of Manitoba). View showing bluffs along the Assiniboine River, photographed 1890. Credit: Geological Survey of Canada / Library and Archives Canada / PA-050882. Restrictions on use: Nil. Copyright: Expired. Archdeacon William Cockran established the first St. Margaret’s Anglican Church, built in 1861, after some settlement had already taken place. (The church was replaced in 1901). A Presbyterian Church was constructed c. 1869. It is likely that John Lazarus Norquay Sr.’s home settlement at High Bluff along the Assiniboine — because it was small — was enlarged as an electoral riding to the extent that it included representation for the people of the Whitemud River farming area and Westbourne (a.k.a Second Crossing, on the Whitemud), which were accessible from High Bluff via Portage Creek and Lake Manitoba (as were the settlements at Oak Point and St. Laurent). Westbourne Mission, established 1859, sketched c. 1865. The people of Whitemud and Westbourne shared family ties with settlers of Red River, particularly those who lived along the Assiniboine. 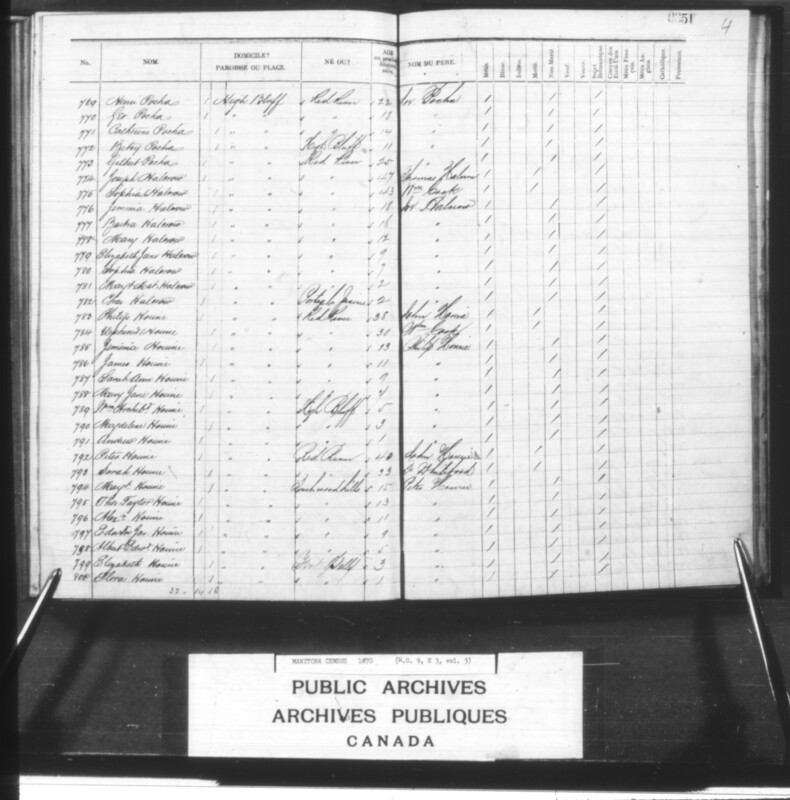 Many were nevertheless considered to be ‘Indians’ rather than Métis (or regarded themselves as sovereign and not under Hudson’s Bay Company jurisdiction, or, as not falling withing the bounds of the new province of Manitoba) and so were not included in the Archibald Census of 1870 (which was designed for the purpose of counting Métis within Manitoba’s boundaries). Whitemud and Westbourne families are included under separate subheadings below, as are families of Rat Creek Portage (on or near where the creek joins the Whitemud — not to be confused with Rat Portage/ Kenora). (For the families of Oak Point and St. Laurent see Baie St. Paul and White Horse Plain, this site). – [676-677] Ann Elizabeth 4, Harriet 2, John Henry 1. 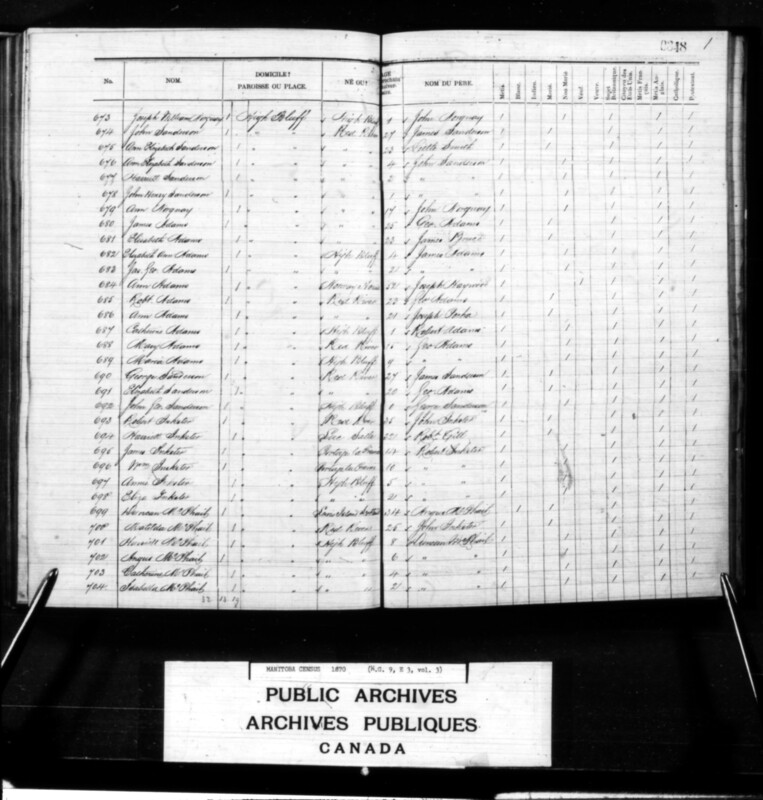 –  Ann Norquay 17 (Métis, born to John Norquay and an unidentified woman). – [493-494] Edwin 4, Mary 2. – [495-496] Francis (son of James Sinclair) 9; Elizabeth Sinclair/ Anderson 14. –  Mary 15,  Maria 9 (Métis, children of George Adams and an unidentified woman). – [695-698] Eliza 21, James 14, William 10, Annie 5. – [707-710] Alex 10, Isabelle 8, Catherine 6, Margaret 4;  John Smith 21. – [701-704] Isabella, 21, Harriet 8, Angus 6, Catherine 4. – [714-717] Donald, 6, Mary, 4, William 3, Christian 1. – [725-732] Robert 15, William 13, John 11, Alexander 9, Martha 7, Elizabeth 5, Flora Ann 3, Sarah 1. – [735-736] Harriet 2, Jane Mary 1. – [753-758] Antoine 10, Joseph William 9, Mary Matilda 6, James 5, Fanny 3, Gilbert 1. – [761-762] Henry George 1, Thomas William 1. – [739-742] Harriet 13, Mary 8, William 6, John 1. – [765-766] Maria 2, George 1. – [769-773] Gilbert 25, Henri 22, George 18, Catherine 14, Betsy 11. – [776-782] Jemima 18, Barbra 16, Mary 12, Elizabeth Jane 9, Sophia 7, Mary 2, Charles 2. – [745-750] John James 10, Joseph 8, Charlotte 6, William 4, Maria 3, Charles Thomas 1. – [794-800] Margaret 15, Thomas Taylor 13, Alexander 11, Edward? Joseph 9, Albert Edward 5, Elizabeth 3, Flora 1. – [785-791] Jemima 13, James 11, Sarah Ann 9, Mary Jane 7, William Archibald 5, Magdelene 3, Andrew 1. –  George Charles 13, [804-807] Emma 11, Edwin 9, John James 5, Ronald 2. The first survey of Treaty First Nations people in the vicinity took place in 1876. Names of First Nations individuals and families of the area will be added to the list below as they are found and sorted. No. 43. Aaytahohoummeekeemuek[? ], married to an unidentified woman. – 1 son, 1 daughter [in 1875]. No. 5. Ahpiskekoonan/ Ahpeskekoman/ Pierre Roulette Sr., married to an unidentified woman. – 3 sons, 2 daughters [as of 1875]. Present at Portage by 1851. Spokesman for Portage Band (1871), whose remarks indicate that the people of Whitemud considered themselves to be a separate Band, with their own Chief — though for treaty purposes, Canada initially considered the inhabitants of Whitemud as co-extensive with First Nations people living at the Portage. No. 18. Antoine Awasis, married to an unidentified woman [in 1875]. No. 24. Francois Boileau (no description; absent in 1875?). – Alexandre 16, Michel 9. No. 39. Joseph Boileau/ Beaulieu (no wife listed, 1875). – Eulalie 19, Patrice 14, Isadore 6. No. 26. Paul Desjarlais, married to an unidentified woman. – 3 sons, 2 daughters [in 1875]. No. 11. Eliza Desmarais (no husband listed, 1875). – 3 sons, 4 daughters [in 1875]. No. 43. Francois Desmarais (no wife listed). No. 27. Kaywetahpenais (no description; absent 1875?). No. 9. Kecheepenais/ Kitche piness, married to an unidentified woman. – Netawoosake/ Sarah 18, John George 14, Augustin 12, Michel 10, Marie 8 [12? ], Alexander 6. Keekonisance was present at Portage by 1851. He was affiliated — by way of paylists — with the Portage Band (1871), Short Bear/ Long Plain First Nation (1876), and Whitemud/ Sandy Bay (1877); withdrew from treaty (1887); reinstated (1892). No. 15. Manookeesik/ Mano-gezhic, married to an unidentified woman. – 3 sons, 4 daughters [as of 1875; present in 1876 with wife and 8 children]. No. 23. Christine Mateonwenin[?] (no partner listed in 1875). – 1 daughter [in 1875]. No. 12. Michael/ Michel Mattoawenine/ Matta we we, married to an unidentified woman (1875). – 4 sons, 2 daughters [in 1875; present in 1876 with wife and 7 children]. No. 22. Baptiste Matwawenind Jr. (no wife listed, 1875). – 1 son [in 1875]. No. 40. Francois Matwonunin/ Mat wa we we nin, married to an unidentified woman [as of 1875]. [Present in 1876 with wife and child]. [Present in 1876 with wife]. No. 28. Antoine Mossons[? ], married to an unidentified woman. 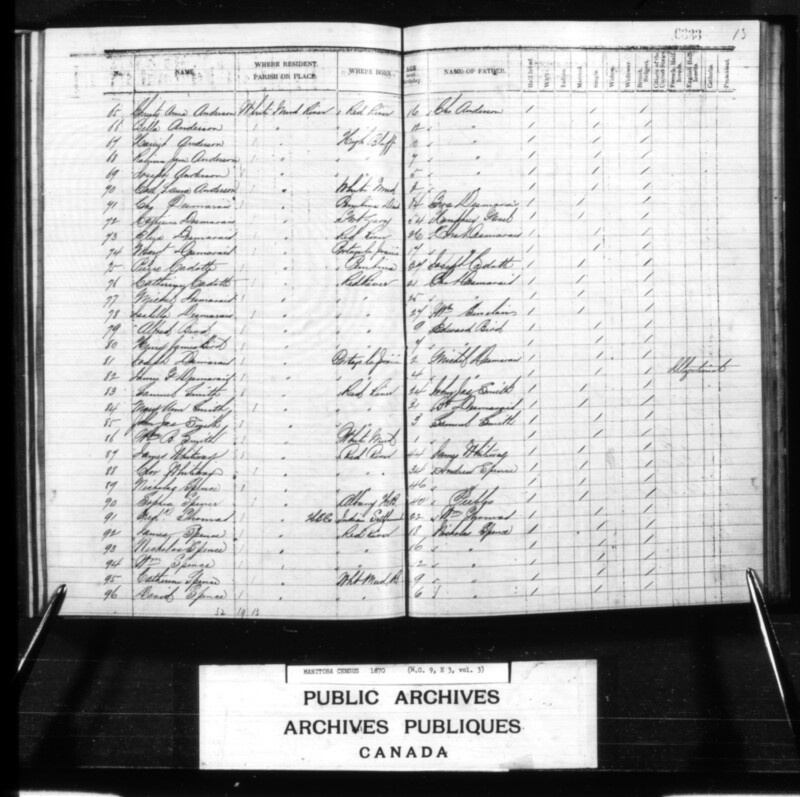 – 2 sons, 2 daughters, 1 other relative [in 1875]. [Chief] No. 1. Nahweecheewaykahpow/ Nawachegapow/ Na Wa Witchecapo/ Nanawatchekapowo/ Na-wa-che-way-ka-pow/ Na-naw-wachaw-wa-ca-paw, married to an unidentified woman. – 2 sons [in 1875]. – By 1874: six sons. No.36. Nichtamekapowwek (no husband listed). No. 37. Ota ange (no wife listed). No. 31. “Papahmagsit’s ‘Mother'” (no description; absent in 1875?). No. 41. Basile Pacheto, married to an unidentified woman. – 1 son, 1 daughter [as of 1875]. – Wahpeskekoman/ Ahpekekoman/ Wahpeskekoman/ Pierre Roulette 1. No. 44. Shahmageniah/ Sha mog o nis (no wife listed in 1875). No. 32. 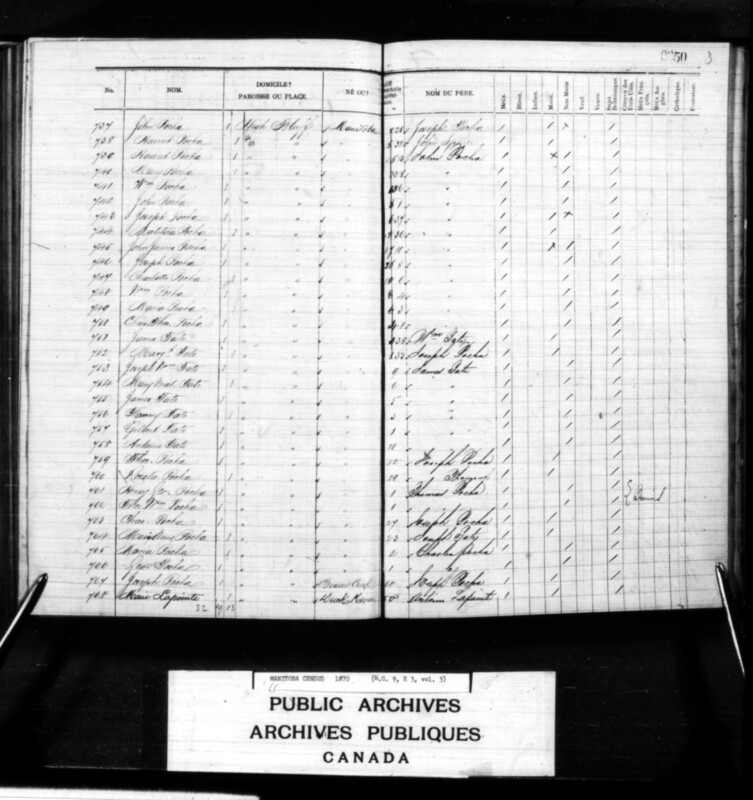 George Spence (Métis, born 1828 to William ‘Wallach’ Spence and Reine Trottier) married Janet Sinclair (separated) and lived with Marie Gorre (Métis). – Joseph 1 [2 other sons as of 1875], 2 daughters [as of 1875]. No. 19. William Spence, married to an unidentified woman. – 1 son [as of 1875]. No. 34. William Sutherland (Métis, born 1847 to #4552 Robert Sutherland and Catherine Asham; stepmother throughout childhood was Ann/ Jane Henderson) married Margaret Desjarlais (died c. 1881). – 1 son (Alexander 1), 1 daughter (by 1875). Previously lived with parents at Portage la Prairie. On 15 July 1870 was at Manitoba House. Present at Whitemud in 1876 with wife and 3 children. No. 8. Tahgense/ Tah-ganse (no description 1875; absent?). No. 6. Tootooch/ Too-toosh, married to an unidentified woman. – 3 sons [in 1875]. Weegeegon/ Weewagon/ Wesekun/ Weezegan (Saulteaux; died c. 1886/ 1887) married Peequakotoos (died c. 1900 at St. Boniface home for the aged). – By 1871: 1 boy, 2 girls. Took annuity at Portage and Whitemud. No. 10. Welimes[? ], married to an unidentified woman. – 4 sons, 3 daughters [in 1875]. No. 14. “Widow West” (Attange-kapaweek/ Madeleine?). No. 3. Wuesecoop/ Wees-coop, married to an unidentified woman [Sioux]. – [6-7] Kate 3, William 1. – [10-17] Baptiste 20, Monique 18, Christian 16, Jean-Baptiste 13, Ellen 11, Julia 8, Michel 4. 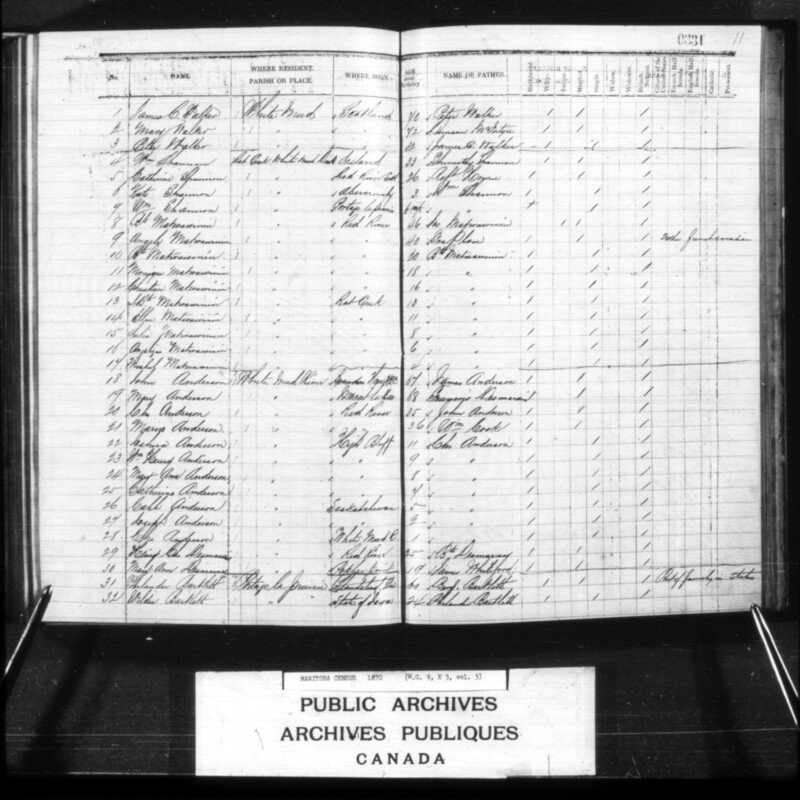 [2 sons, 4 daughters in 1875 Paysheet]. – [22-28] Joshua 11, William Henry 9, Mary Ann 8, Catherine 7, Caleb? 5, Joseph 3, Charles 1. 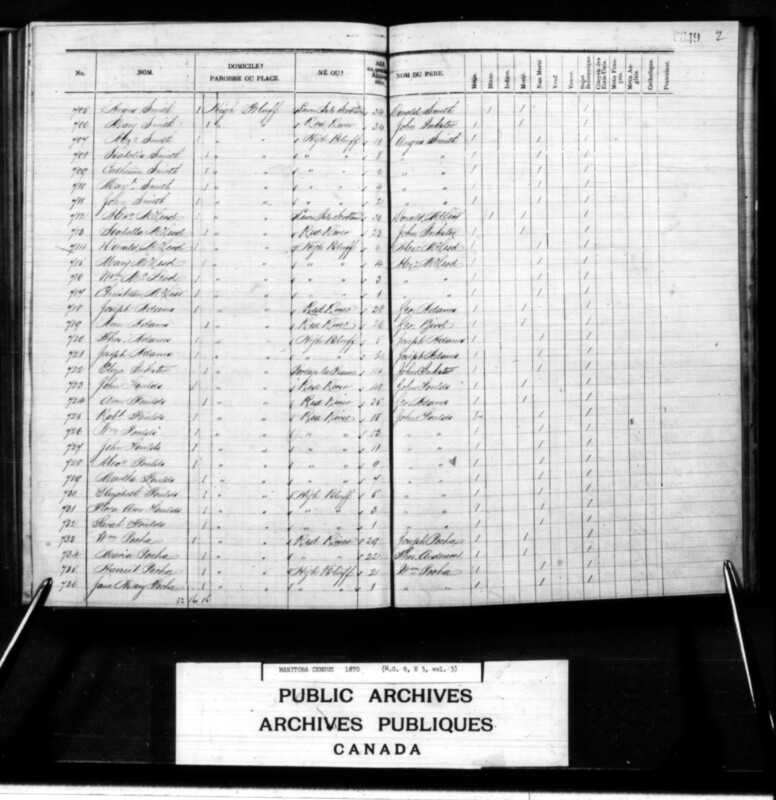 – [34-35] Charles Thomas Desmarais 3, Elizabeth Jane Desmrais 1. – [40-44] John Peter 19, Rebecca 15, Flora Sara 12, Victoria H. 10, Maria Jane 6. 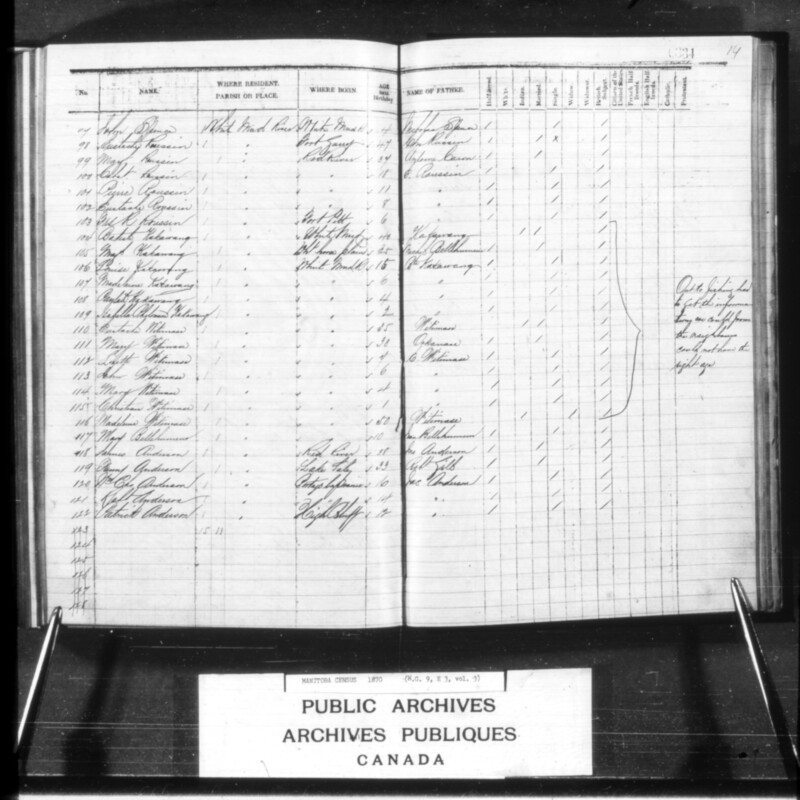 – [47-49] William Rupert 8, Adelaide Flora 5, James 2; Flora Budd Hodges (Métis, daughter of Andrew Patterson) 10. – [62-64] Charles 22, William 21, James 18, [65-70] Christy Anna 16, Bella 12, Harriet 10, Robina Jane 7, Joseph 5, Catherine Laura 2. – [73-74] Eliza 26, Margaret 17. – [81-82] James G. 4, Joseph 2. – [85-86] John James 3, William B. 1. – [92-97] James 18, Nicholas 16, William 12, Catherine 9, David 6, John 4. – [100-103] Cabot 18, Pierre 11, Eustache 8, Francois R. 6. – [106-109] Louise 15, Madeleine 6, Paylete 4, Isabelle Philomene 2. – [112-115] Lizette 7, John 6, Mary 4, Christian 1. 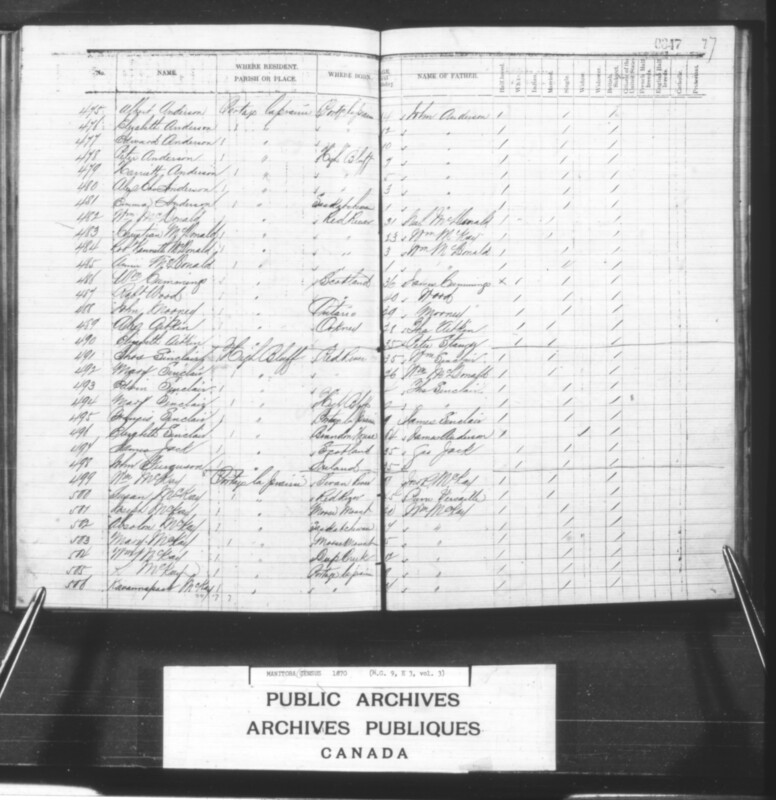 –  Mary (Métis, daughter of J. Bellehumeur) 10. – [120-122] William Charles 16, Robert 14, Patrick 12, [123-126] Mary 10, Eummina 8, Nancy Sophia 5, Philip 2. – [129-132] Mary 8, David 6, Harrier 5, David 2. – [135-140] Uphenia 16, James C. 14, William Robert 12, Andrew 10, Peter 5, John 2. – [Marie 20? ], [144-148] Louis 17/ 18, Mary 16/ 18 (married Lawson Wesawok), John ‘Johnny’ 14, Ellen/ Helene 8/ 10, Elisa 6. Baptise Spence, either Sr. or Jr., took treaty with, or at the same time as the St. Peter’s Band (Treaty 1, 1871). – Jean Baptiste ‘Samuel’ 15/ 17, Paul 11, Jean-Baptiste 6/ 7, Francois 4, Patrice 2, William 1. David Anderson took treaty with, or at the same time as the St. Peter’s Band (Treaty 1, 1871). No. 4. 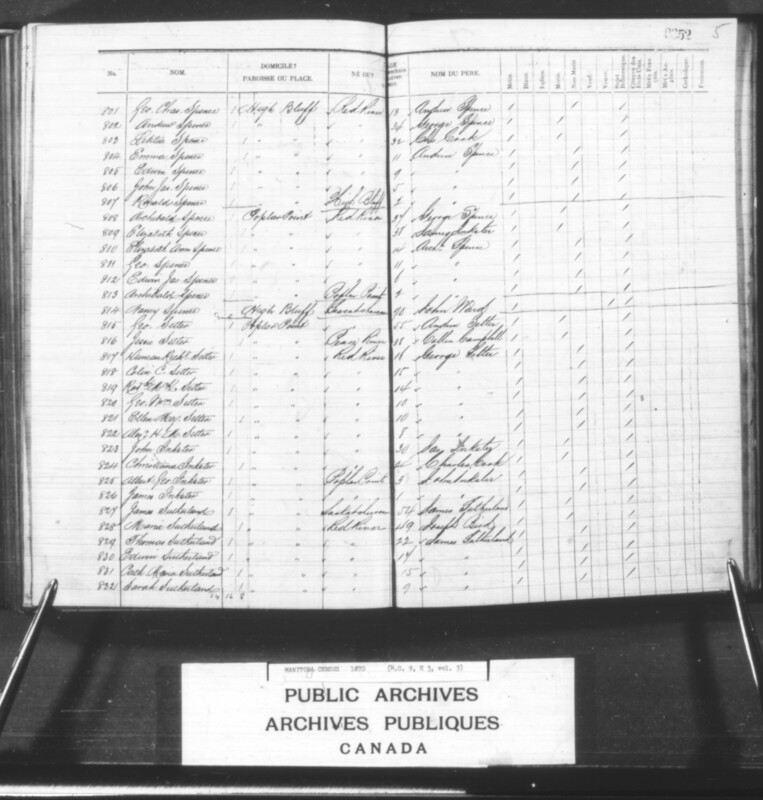 Francois Desjarlais, married Henriette Gladu (Métis). – Marie 4, Joseph 1. Present in 1869; 1 son, 2 daughters in 1875; present 1876 with wife and 4 children. – Thomas 12, William George 11, Josephte 8, Madeleine 2. The church mission, parsonage, and school, established as early as 1859. –  Kenneth McKenzie 22, Laura 16, John West 14, Emily 12, Isabel Margaret 6, William C. Ridley 3, Alice Jane 1. George Duncan M. McVicar (Michigander, born 1846 to D. McVicar). – [156-158] Ann 21, Kenneth 19, James 17. 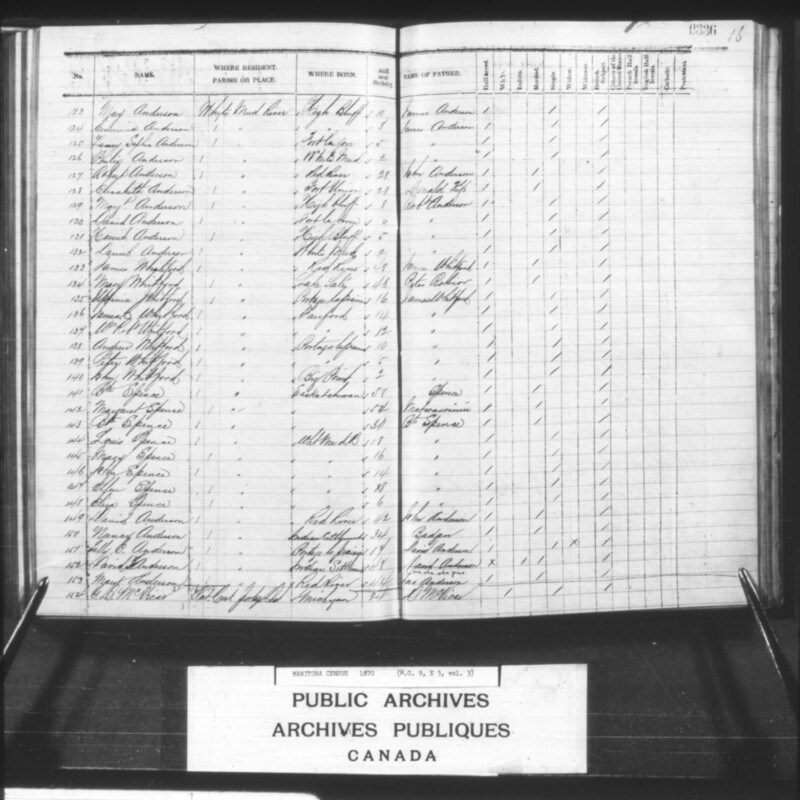 – [161-167] James H. 15, Robert John 13, Clarice M. 10, Albert H. 9, Ancel B. 6, Chester G. 4, Mary L. 1. – [170-178] Samuel 20, John Black 18, Alexander 16, Peter 14, Robert 12, Daniel Neil 8, Catherine Jane 6, William Donald 4, Flora Ann 2. 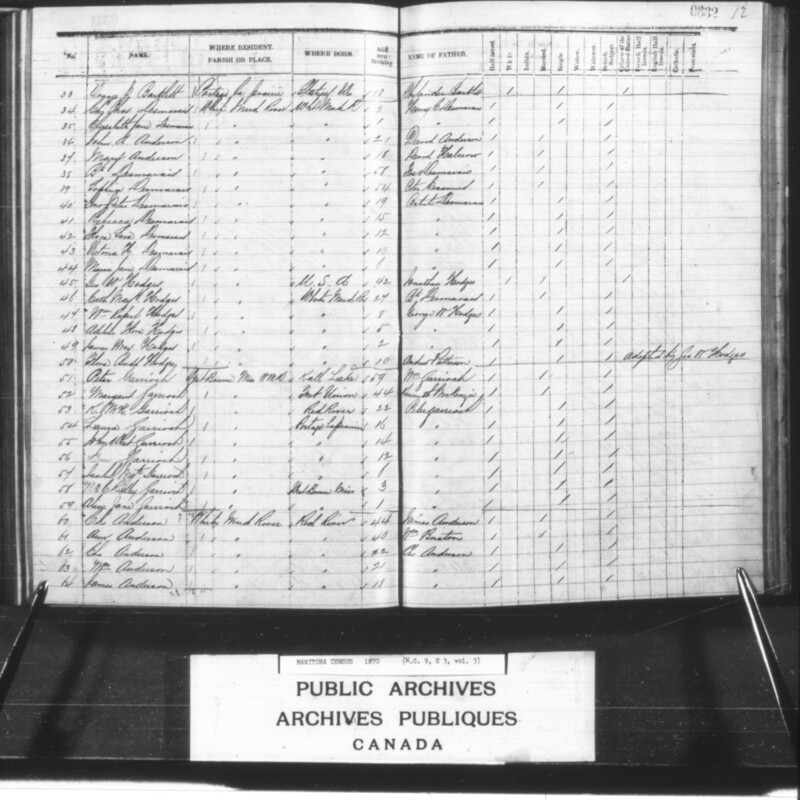 First marriage Sept 1, 1858, to Josephte, a Saulteaux woman, one son Jean Baptiste (Samuel) Spence, born 1853 along the Grand Coteau. 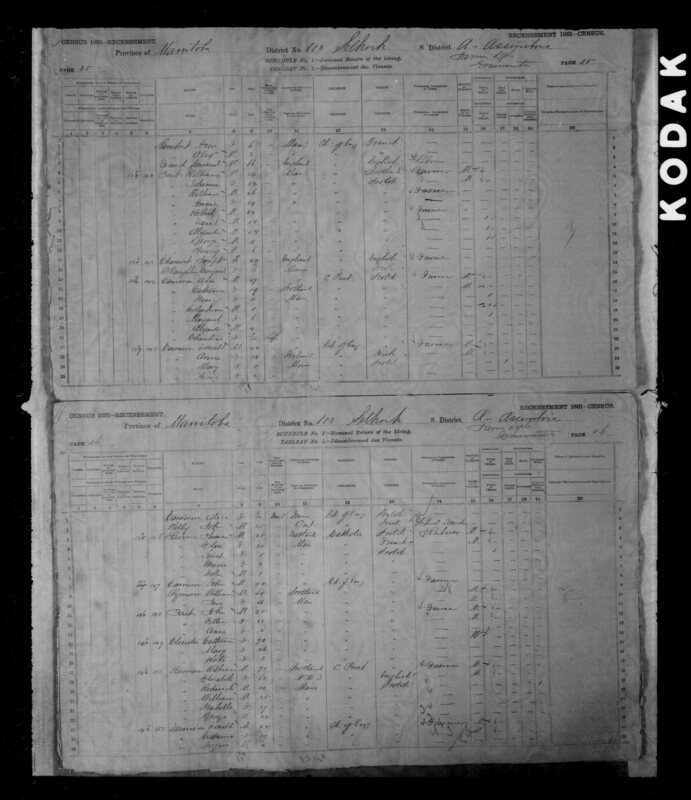 In 1870, the time of this census, he would be age 17. Second marriage Aug 24, 1864, to Marie Kijipayashik, a Saulteaux woman, one son Jean Baptiste Spence, born 1863 at Whitemud River. He would be age 7. Another son Paul, cannot verify, my records are in storage. A third son Francois, born and died shortly after. I have these church records but they are in storage right now. Third marriage June 17, 1867, to LaLouise Fisher, daughter of Henry Fisher Jr. and Marie Anne. Children son Patrice born about 1868 and died shortly after. Another son William born 1870. 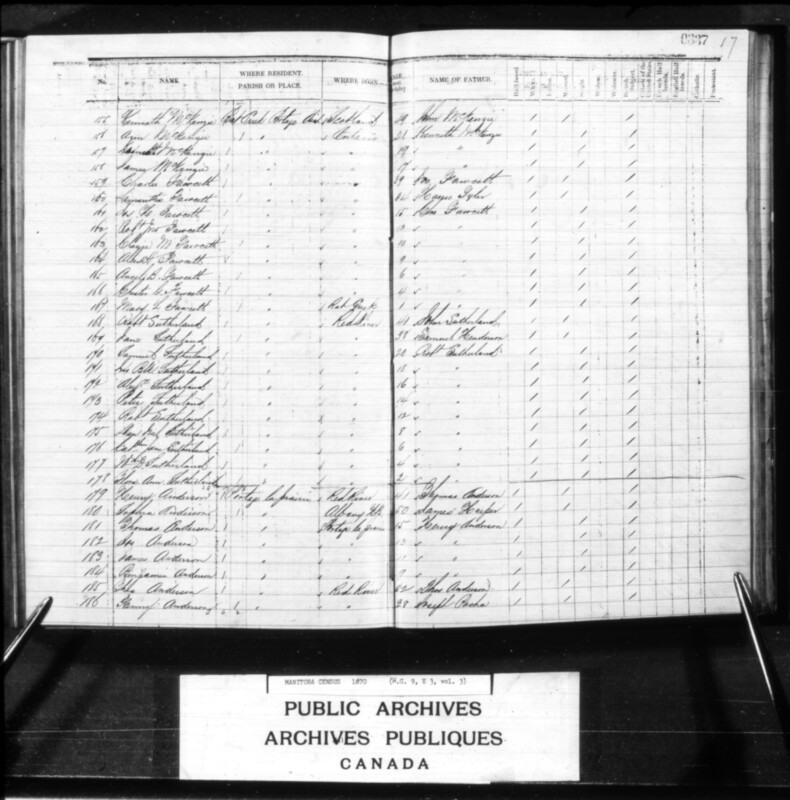 They had many children, all born after 1870 when this census was done. Many thanks for catching the error Ida, and for supplying solutions — I’ll get these sorted asap.